I am in love with this book. The League of Regrettable Superheroes is pretty much the perfect coffee table book for the everyday nerd. Gorgeously designed and fantastically organized, this book is filled with all kinds of fun little factoids that even the most casual readers can enjoy. Split into three sections – the Golden Age, the Silver Age, and the Modern Age – Jon Morris takes us through the history of forgotten superheroes. While you might think that some of them are made up the truth is that every single character featured was a real, published comic book superhero at some point or another (comics are weird). Not all of them are necessarily regrettable in the strictest sense. Some – like “The Eye,” Slapstick, or M.F. Enterprises’ Captain Marvel – absolutely are. Then there are some – like Fatman or Doctor Hormone – with particularly regrettable monikers. But others are ‘regrettable’ for other reasons such as their short publication histories. You’re bound to discover new favorites as you read through this book. I’m not going to lie, I went over to Comic Book Plus to actually read some of the books that had fallen into the public domain. Some of them are just too ridiculous to believe ever existed. I mean it. Some of these characters you need to see in action for yourself. Of course, Jon Morris’s clever commentary is the best part of this book. This is a guy who really does love all these oddballs and he does a fantastic job of giving each character their due. I had a smile on my face the entire time I was reading because I just loved how he managed to chronicle their brief histories. Quick with clever quips at times, he’s still very respectful of the characters and their stories. He’s not just making fun of these characters – he’s introducing them to you. My only problem with this book was the short introduction and the sudden ending. The book ends after it’s last hero with nothing more than an acknowledgement page. Jon Morris has been researching and highlighting the heroics of comic book heroes from days past for a long time on his blog Gone and Forgotten. And he’s a fantastic artist in his own right. I would have loved if there had been an additional section in the back about the process of creating this book if nothing else. There’s also nothing regrettable about Squirrel Girl. Nothing (…okay, yeah, there is)! If you’ve got a healthy appreciation for the quirkiness of comic books, definitely pick this one up. And consider getting it for others if a friend of family member has a birthday coming. 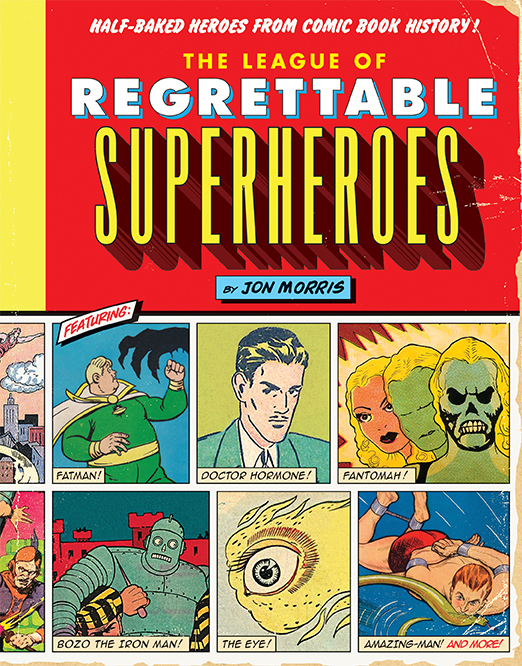 The League of Regrettable Superheroes is the perfect gift book for old and new comic book fans alike. Anyone with a love of all things nerdy will enjoy reading about all of these largely unknown heroes from days past. And if you enjoyed the book, keep up with Jon Morris – and comics’ oddballs – over on Gone and Forgotten. A review copy of this title was provided by Quirk Books in exchange for a fair and honest review.